Could be replaced by individual RGB LEDs. You may need long wires to guide the LEDs from your shoulder to your hand. This can be used to replace the Neopixel strip. Option to replace some wires. I'm an engineer and artist who enjoys projects that combine science and arts. I've been making dress designs with microcontrollers embedded within so that certain functionality of electronic components can be used to enhance the design theme. For this project, I want to use the pattern matching engine (PME) and the accelerometer inside Intel Curie on Arduino 101. Curie is made for PME applications as it has neural network capability but there hasn't been a lot of PME examples out there. I hope this example may inspire you to extract Curie's PME capability. The dress uses a page of my graphic novel as the fabric. A scientist and her robot are looking into the telescope. As the wearer draws a pattern in the air, a set of LEDs arranged in the shape of constellations will shine in the night sky on the fabric. *Note: after this project was published, I renovated the electronic circuit portion. An improved method to attach the LEDs to the cloth and how to make them durable is now published below after step 3. ** Update: wearing this dress for a few all-day demo events provided estimate of the battery life. To power this dress, the 9 V battery needs to be changed about every 3 hours. The battery does not get drained but it drops below 9 V, making it inefficient to do the pattern matching. You can save the battery for other uses. I used a NeoPixel strip from Adafruit, cut it up into pieces and arranged them into the shapes of constellations. Feel free to use other types of LEDs such as the individual RGB LEDs. Glue or sew them onto the base fabric. Put an interfacing fabric on the top and you can outline the constellations. This step is optional but I found it helpful to have multiple layers of fabrics to strengthen the structure. I actually sewed another thick fabric onto the back of the base fabric. So three layers in total as the base, sandwiching the LEDs. Solder the LEDs. If you use the sew-able individual LEDs, you can also use conductive threads to connect them. Either way, it's a lot of manual labor and requires patience. As I have four constellations (Orion, Big Dipper, Cygnus and Cassiopeia), I separated them into four traces. Each will be connected to a different Arduino 101 pin. The fabric I used for the above steps was too soft, which makes it easy to bend the LEDs and wires, breaking the soldering joints. I re-did the whole process with the following improved method. I used a NeoPixel strip from Adafruit and cut it up into pieces and arranged them into the shapes of constellations. Feel free to use other types of LEDs such as the individual RGB LEDs. Glue or sew them onto the base fabric. Felt is a nice type of thick fabric that gives structure and works well with hot glue. Arrange the LEDs into respective positions so that when they light up, their positions reflect stars in constellations. Glue the LED stripes onto felt at a few points. Do not put glue under the whole strip because you need some leeway to slide heat-shrink tubes around, as shown in the figure. Cut stranded wires into the right lengths and place them onto their relative positions on the same piece of felt. I would recommend not to hot glue the wires just yet. My figure here is a blunder in that respect. Rather, it is better to hold the wires in their positions with temporary tape so that when you solder the wires to the LEDs, the wire positions can be adjusted. The figure shows that I prepared four constellations (Orion, Big Dipper, Cygnus and Cassiopeia) onto four separate pieces. After soldering and heat-shrink around the soldered joints, you can glue everything tightly onto the felt. Test your circuit before going further! Can just do a NeoPixel Strandtest for each trace. Okay, I put the level as "Easy" since scientifically it's not hard once you understand the code, but it does take a lot of work stabilizing the cables on the fabric. Make sure that your Arduino IDE is the latest version and has Curie PME library. I'd recommend using the Arduino Web Editor. Download the library here. In parallel (figuratively), make the dress. After you test the circuit, sew the base fabrics with the LEDs onto the inside of the dress. LEDs will shine through the graphics. As you can see, the Arduino 101 is in my hand. I made a 3D printed case for the Arduino 101 and battery. There are long wires connecting the LEDs and the board, which are hidden in the sleeve. I plugged the 9 V battery directly into the barrel jack. This is an updated script from the previous one. It stores the training data. Currently, it is set up with an initialization step. The first series of LEDs shows Red when power is on. Holding the Arduino101 flat with the USB port pointing in the horizontal direction, while pressing the button, allows usage from previous training. These LEDs change to Green then Blue when button is released, indicating system is ready. 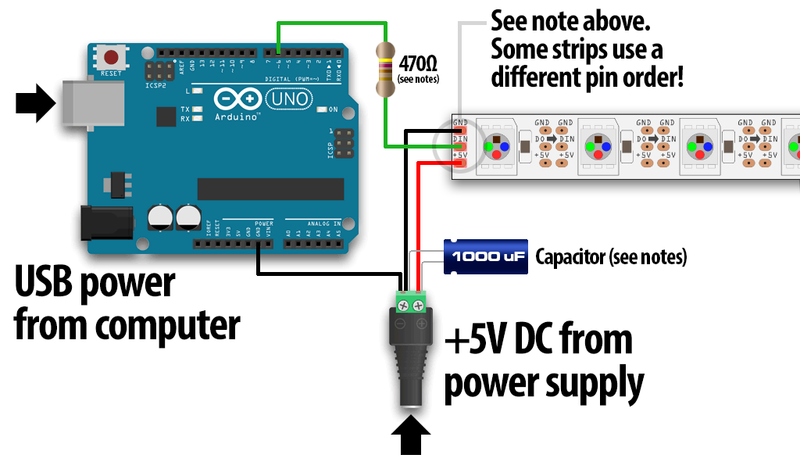 If the Arduino101 is held with the USB port pointing in a vertical direction, while pressing the button, previous training data is erased. System can be retrained upon releasing of the button. * to classify streams of accelerometer data from CurieIMU. * will try to guess which letter you are drawing. * NOTE: For best results, draw big letters, at least 1-2 feet tall. * See license notice at end of file. #define PINM 6  //// what pin are the NeoPixels connected to? Adafruit_NeoPixel stripM = Adafruit_NeoPixel(10, PINM, NEO_GRB + NEO_KHZ800);  /// the strip is 15 pixels long. You can change this for the number of pixels in your individual strip. /*  This controls how many times a letter must be drawn during training. * The file contains all the data that was learned, then saved before. // iterate over the network and save the data. // so you can see what is happening. * 1. Each sample consists of 3 signed 16-bit values (one each for X, Y and Z). *    cutting sample size in half. * Input a value 0 to 255 to get a color value. Used for rainbow effect above. * Theater Chase lights from Adafruit strandtest example code. This takes whatever the curent RGB value is, and does a "theatre chase" effect with it. This is using the Curie PME to control LEDs. It's basically a combination of the Draw in the Air PME code and the Adafruit NeoPixel example code. This code is not exactly what I used (which is a bit complex) as I doubt you'll make the exact same kind of constellation arrangement. Rather, here is a generic code which you can modify to personalize your need, e.g. you can change how to distribute the pins for different LED strips. I may update it with an improved code later. #define PIN 6  //// what pin are the NeoPixels connected to? Adafruit_NeoPixel strip = Adafruit_NeoPixel(54, PIN, NEO_GRB + NEO_KHZ800);  /// the strip is 15 pixels long. You can change this for the number of pixels in your individual strip. /// these functions are written out at the bottom of the sketch. // Rainbow! Note- this function blocks new position inputs until it's finished. // Input a value 0 to 255 to get a color value. Used for rainbow effect above. //////Theater Chase lights from Adafruit strandtest example code. This takes whatever the curent RGB value is, and does a "theatre chase" effect with it.